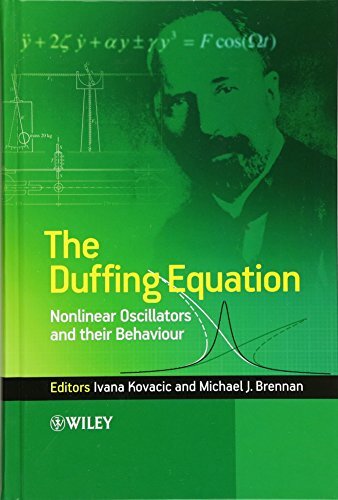 [PDF] The Duffing Equation: Nonlinear Oscillators and their Behaviour | Free eBooks Download - EBOOKEE! Description: Product Description: The Duffing Equation: Nonlinear Oscillators and their Behaviour brings together the results of a wealth of disseminated research literature on the Duffing equation, a key engineering model with a vast number of applications in science and engineering, summarizing the findings of this research. Each chapter is written by an expert contributor in the field of nonlinear dynamics and addresses a different form of the equation, relating it to various oscillatory problems and clearly linking the problem with the mathematics that describe it. The editors and the contributors explain the mathematical techniques required to study nonlinear dynamics, helping the reader with little mathematical background to understand the text. The Duffing Equation provides a reference text for postgraduate and students and researchers of mechanical engineering and vibration / nonlinear dynamics as well as a useful tool for practising mechanical engineers. * Includes a chapter devoted to historical background on Georg Duffing and the equation that was named after him. * Includes a chapter solely devoted to practical examples of systems whose dynamic behaviour is described by the Duffing equation. * Contains a comprehensive treatment of the various forms of the Duffing equation. * Uses experimental, analytical and numerical methods as well as concepts of nonlinear dynamics to treat the physical systems in a unified way. No comments for "[PDF] The Duffing Equation: Nonlinear Oscillators and their Behaviour".